With the World Cup just around the corner, we can now the betting world warming up for some very active weeks. This world cup is peculiar, some popular teams did not make it past the qualifying stage, as it was the case for Italy, Netherlands, United States and Chile. There are always surprises in each World Cup, in Brazil 2014, for instance, one of them was Costa Rica, a team that made it to the quarterfinals, achievement that no one was expecting. Costa Rica’s national soccer team is in Group E of the Russia World Cup 2018, and it’s precisely this group that we will be analyzing in this occasion. 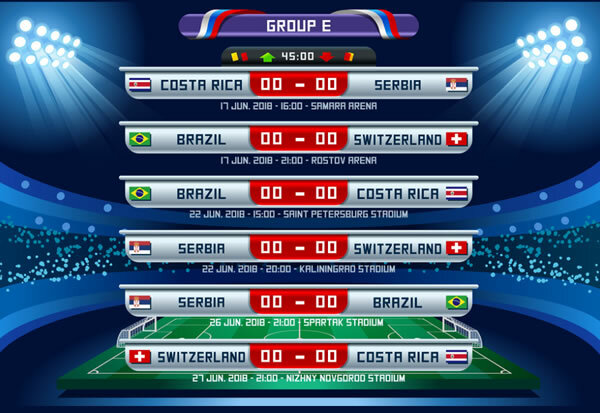 Group E is formed by Brazil, Switzerland, Costa Rica and Serbia. The Brazil National Team probably felt great about landing in this group, since if we go by history and statistics they are the best team in the group and should have no problem getting past their rivals. Brazil has won five world cups, and it is one of the favorites to win again this year. Their speed, ability with the ball and technique places them several steps ahead of the other contestants. Brazil should qualify as the first in this group; this is reflected in the odds, that right now show -2005 for Brazil advancing from Group E.
If we analyze the players one by one, the Swiss are actually a very solid team. The team holds the 6th position of the FIFA Ranking, not bad at all; probably Switzerland’s main problems are probably their teamwork and their offensive line. The work the coach does to bring the team together and give it flexibility will make all the difference in the world. This is certainly not an easy group for the Central American team, but then again, every group has its difficulty. Costa Rica surprised in the Brazil World Cup, it is ranked in position 23 of the FIFA Ranking. Their main strength is the fact that they have with them one of the top 3 goalies in the world, Keylor Navas, but, it takes 11 players to get the job done. Costa Rica has an experienced team of players, the majority of which play for international clubs. The “Ticos”, however, did not impress during the qualification stage; the main problem seems to be that they depend too much on key players, Navas, Ruiz, Borges. Their offense needs a lot of work, and in general, they have become predictable. The head coach needs to come up with a few good plans because an “average” performance will not be enough to get past the first stage. Costa Rica plays with heart, and that helps them get positive results. It appears in the FIFA Rankings in position 34, but don’t be fooled, Serbia is a dangerous team. They are motivated and ready to start making a statement in the world of soccer. The change of coach after qualifying to the World Cup certainly leaves some questions in the air. Serbians might still be a work in progress, but they have strong players and a particularly good defense. The game to look forward to in this group is certainly Brazil vs. Switzerland. Costa Rica vs. Serbia is also a good game to bet on, Serbia is a favorite right now, I’d take Costa Rica or the draw in this game. This is an interesting group, and even though Brazil and Switzerland seem like the strongest teams in the group, after checking the lines and consulting the experts at AcePerHead.com, Brazil and Costa Rica are my picks to advance from Group E.
WHAT DOES THE FUTURE HOLD FOR BOOKMAKERS? DOES YOUR SPORTS BETTING SOFTWARE PAST THE TEST? WHICH IS THE BEST PAY PER HEAD FOR YOU?